Who among us remembers Sharpsville’s Welch House on Main Street? When it was suggested I write something about this “boardinghouse and tavern,” I hardly had a clue. That is, until I heard from my brother, read about it in my father’s memoir, and was provided the details of its early history by Ralph C. Mehler of the Sharpsville Area Historical Society. 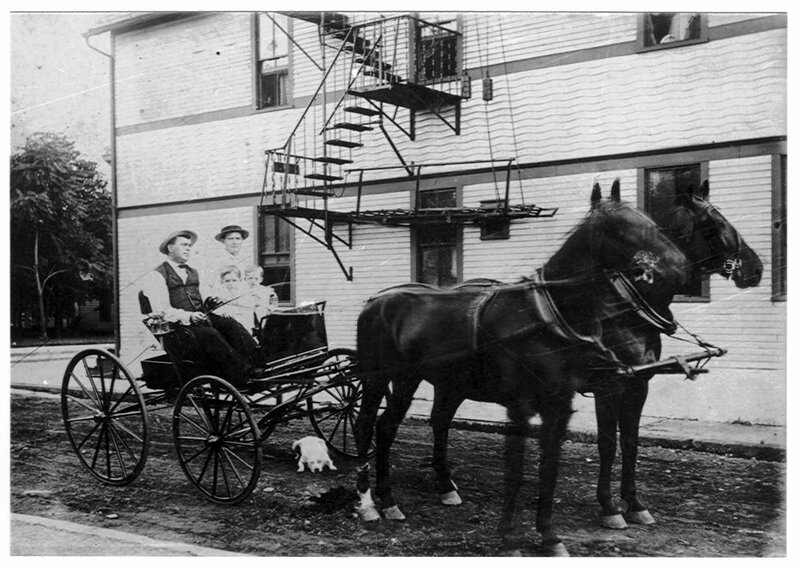 At one time Sharpsville had at least three hotels. 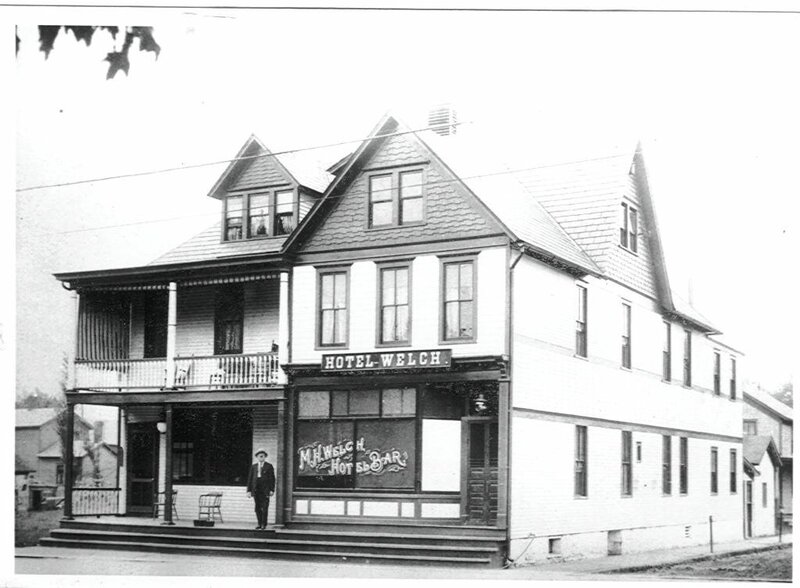 In the early 1900s, they were the Knapp Hotel run by George Mahaney, Pierce Hotel run by James P. Clark, and the Hotel Welch, the proprietor of which was Martin Henry Welch. I believe the Welch House was between 4th and 5th streets on the [north] side of Main Street, close to Wade D. Mertz & Son which sold hardware and lumber. It was a historical landmark, having been there for many years. I think it burned down during the 1950s. I remember it because I delivered newspapers there. My father wrote in his memoir that, when he and my mother purchased Angel’s Casino on North Second Street in 1953, they spent the next several years supplying the dance hall and its kitchen with second-hand items acquired from other establishments that were selling off their equipment. Among the purchases were a stove, working table, french fryer, and other items from the owners of the former Welch House after it burned down in 1954. Ralph C. Mehler has generously provided the rest of the story. [Hotel Welch, c. early 1900s. Main Street, Sharpsville, PA.
[Interior View of Hotel Welch Bar. c. early 1900s, Main Street, Sharpsville, PA.
Michael Knapp was born in the Saarland region of Germany in 1842 and came to America with his family around age 8. His father worked the coal mines of what is now Hermitage. During the Civil War, Michael enlisted in the 211th Regiment Pennsylvania Volunteers from September 5, 1864, until the end of the war. He also worked the local mines after the war. In the 1880 U.S. Census, he is listed as a hotel keeper, likely manager of the Pierce House, the only hotel in Sharpsville at the time. (It should be noted that due to the stringency of liquor licensing laws then, hotels were pretty much the only watering holes in town.) In 1886, we learn that he had struck out to build his own inn and tavern – the Knapp House – located on Main at Fourth Street. By 1900 Michael Knapp had sold the Knapp House to his son-in-law Nicholas Mehler when it was re-named the Mehler House (as it appears on the 1901 Birds-Eye View map of Sharpsville*). 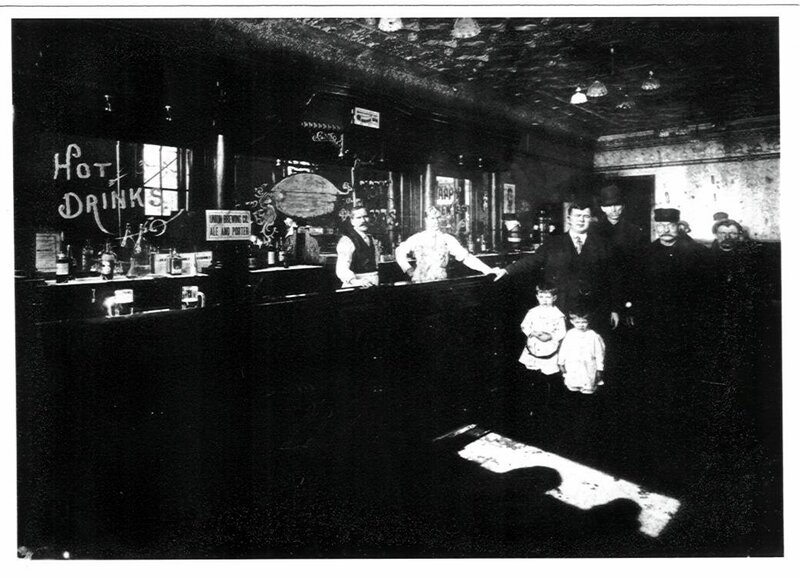 Nick Mehler, besides owning a coal mine and later becoming a popular barber in Sharpsville, apparently owned the tavern for just a few years before selling it to Martin Welch around 1904. *An excerpt of the map is shown below (the hotel is marked with a 3). The map can be seen in its entirety here. Michael Knapp, in the meantime, erected a three-story hotel, the Knapp Hotel, in 1903. Likely overburdened by the crushing finances of the venture and perhaps still despondent over the death of his only son three years prior, Michael shot himself the day before the hotel opened. Nick Mehler’s son, Ralph C. “Dutch” Mehler I, originally started selling insurance out of his barber shop on the other side of Walnut Street. He later moved into the Mahaney Building (as the Knapp Hotel was later called). His son, Ralph W. Mehler (SHS 1955), later moved the insurance office over to the Sharpsville Plaza when it was built. Martin H. Welch purchased Mehler House from Nicholas Mehler around 1904 and the building was then known as Hotel Welch. It eventually became the Welch House, a name that identified the building for the next several decades. Ed Welch, a professor emeritus living in Michigan is the grandson of Martin Henry Welch and the son of Edwin Martin Welch. In 2005 he donated the above photographs to the Sharpsville Area Historical Society (SAHS). Ralph C. Mehler of the SAHS made the photos available for this story. I have a snapshot taken in early 1957 of Joe DeSantis and Sugar Cione dancing inside Angles Casino. It’s kinda dark but I remember the inside of Angeles being dark as well.